There are truly outrageous vending machines out there in this world, but this one takes the cake. There are truly insane vending machines out there in this world that vend everything from burritos to live crabs. But the crack pipe vending machines that have recently popped up in Vancouver, Canada might be the most outrageous of them all. 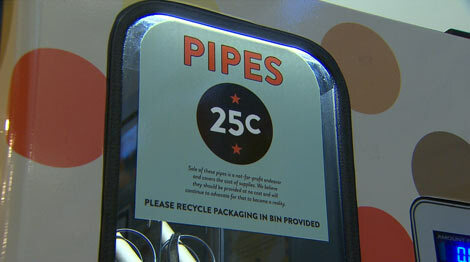 Crack pipe vending machines—the first of their kind in Canada—were installed in Vancouver’s troubled Downtown Eastside in an attempt to curb the spread of disease among drug users. The machines, operating at Portland Hotel Society’s Drug Users Resource Centre, dispense Pyrex crackpipes for just 25 cents. CTV News reports that the vending machines are part of a harm-reduction strategy introduced by InSite, North America’s only medically supervised safe injection site. Kailin See, director of the DURC, explains that the pipes are very durable and less likely to chip and cut drug users’ mouths, which helps stop the spread of diseases like HIV and hepatitis C.